This ambitious project restored and conserved the surviving nave of a Romanesque rotunda, which dates back to the late 11th-century and reveals the origins of the city of Prague. The remains were discovered in a newly uncovered space inside a building of Charles University (within a UNESCO World Heritage Area). The restoration work was based on the premise of minimizing any visible interventions. The project, led by a team at Charles University in Prague, was supported by EEA/Norway grants and private donors. The jury appreciated “the display of the archaeological layers and the efforts in presenting and interpreting these remains. The project is an example of good in situ preservation”. The first written record of the rotunda appears at the beginning of the 13th century and shows a close connection to the Czech patron saint, St. Wenceslas. The chapel disappeared as new buildings were constructed and was considered lost. During construction works in 2004, the remains of the building were rediscovered. The type of hexagonal embossed tiles present has not been discovered anywhere else in Europe. The discovery of a sacral structure from the mid-10th century is of immense importance for the history of Christianity and its architecture in Central Europe. The structure demonstrates the inter-ethnic links of the site and provides material for comparative evaluation. 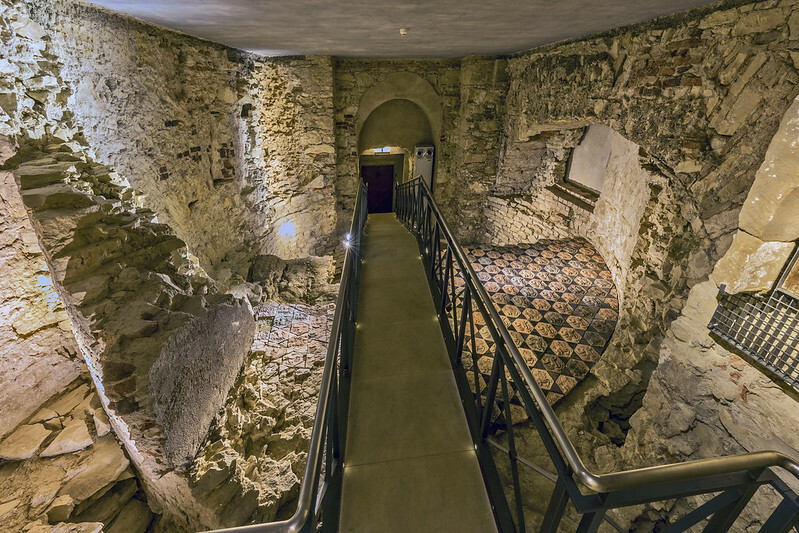 A unique new exhibition space was created to optimally exhibit the tiles dating back to the 11th-century, the fragments of the foundation and above-ground masonry. The finds are now accessible via a footbridge complete with lighting and steps, and a replica of the original floor was laid on one side of the nave. A new multimedia exhibition was installed for visitors. Archaeological and structural- historical research yielded rich documentation of the archaeological remains. The implementation of the project demonstrated strong interdisciplinary cooperation in practice. Geodesists, geologists, chemists, mathematicians, physicists and artists worked together with restorers and archaeologists to meet the demands of this complex project. The jury appreciated “the efforts of the university to integrate these heritage remains for the instruction of students and the public”. Thanks to this project, unique insights were acquired into the design and the construction technologies used in medieval rotundas which are generally applicable to the whole of European civilization of this period.